· Is this the new capital of smog? February 7 (MSE) On 7 February 2017, the 12 weeks Government bonds /17.224% annual coupon rate/ worth MNT 12.0 billion traded at Mongolian Stock Exchange. February 7(MSE) On the occasion of the 26th anniversary of "Dealers Day", the first trading day of Mongolian Securities Market, executives of Mongolian Stock Exchange, Mongolian Association of Securities Dealers and delegations of securities companies rang the opening bell of 5,408th trading session. During the event, some executives and employees from securities companies awarded as a "Best worker of securities market" tittle. 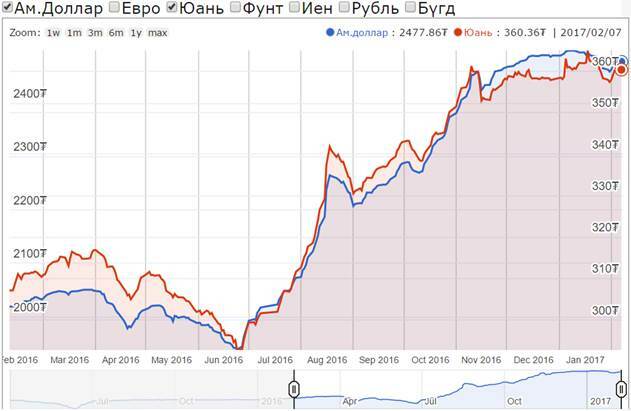 February 7 (Bank of Mongolia) Spot trade: Commercial banks bid weighted average rate of MNT2471.50 for USD13.8 million and weighted average rate of MNT358.26 for CNY67.0 million respectively. The BoM sold USD4.9 million with a closing rate of MNT2476.00. 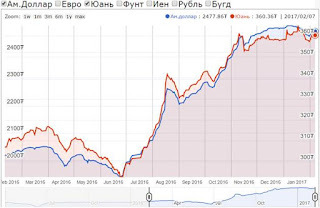 February 7 (UB Post) According to Bloomberg, Citigroup Inc. predicts that Mongolia could sign a 500 million USD relief program agreement before the end of February, as Mongolian dollar bonds returned 1.5 percent in the past three months, the highest return among nine Asian market bonds according to JPMorgan Chase & Co. indexes. 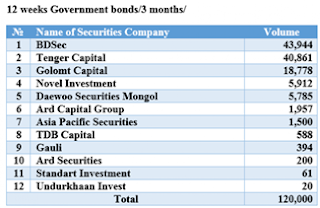 The surging price of copper has helped the value of Mongolian bonds rise exponentially. Copper prices are up 20 percent, mainly due to speculations concerning U.S President Donald Trump's plans to renew infrastructure. AllianceBernstein LP and Morgan Stanley Investment Management predict the bond rally could continue if the IMF relief program is finalized. Vincent Tsui, an economist at AllianceBernstein, noted that the IMF's standby agenda will include support from World Bank, Asian Development Bank and other international financial institutions. The Citigroup statement, issued on January 26, note that there is a "strong likelihood" Mongolia will engage more international markets after receiving the IMF package. Analysts are optimistic about the recovery of the Mongolian economy with rising metal prices expected in 2017, but the appeal of the sovereign bonds still hinge on completion of the IMF deal and successful sales prior to the presidential election in June. While the Ministry of Finance has given assurances that Development Bank's 580 million USD debt will be repaid next month, investors are still waiting to see what developments emerge. February 7 (The Australian) The prospect of supply disruptions at the world's two biggest copper mines is sweetening the price outlook for the metal and stands to deliver a further boost to earnings for mining giant Rio Tinto. The spot price of copper has risen more than 26 per cent since late October, with the recovery that started with November's election of Donald Trump accelerating in recent weeks amid uncertainty over the outlook for the huge Grasberg and Escon­dida mines. The growing issues around the two mines, coupled with a healthy demand outlook for the metal, has prompted analysts at Macquarie to upgrade their price outlook for copper by as much as 11 per cent over the near term. The improved expectations, along with a positive outlook for aluminium, prompted Macquarie this week to hike its 2018 and 2019 earnings forecasts for Rio by 26 and 17 per cent respectively, while it has also made material earnings upgrades to profit expectations for local copper producers OZ Minerals and Sandfire Resources. Rio is set to deliver a strong improvement in earnings when it delivers its 2016 profit result today. Macquarie expects Rio's underlying earnings to come in at $US4.9 billion ($6.4bn), up 9 per cent from a year ago, driven by a surge in profitability over the past six months. Macquarie is modelling for "impressive" growth in Rio's earnings over the back end of 2016, with earnings to have doubled from the first half to the second half. Dividends are also tipped to rise sharply, although Macquarie, UBS and Deutsche Bank all expect the company to play it safe and not announce a share buyback at this stage. Investors will be watching for commentary from Rio chief Jean-Sebastien Jacques on the outlook for commodities, but the omens are looking positive for one of its most favoured metals, copper. There is ongoing uncertainty around the future of the huge Grasberg mine in Indonesia, with the government threatening to block mine operator Freeport McMoRan from exporting concentrate amid a dispute over proposed new regulations. And the Escondida mine in Chile continues to head towards strike action as unions and the mine's operator, BHP Billiton, fight over wages. Grasberg and Escondida are the two biggest copper mines in the world, and Rio has interests of 40 per cent and 30 per cent in the respective operations. Any pain felt by Rio as a result of disruption could be compensated by higher prices for copper from its other operations, such as the big Oyu Tolgoi mine in Mongolia, while it also enjoys a kick as copper prices rally amid the uncertainty. "The real impact in our view is on speculator sentiment because this nebulous force has shifted to being more attuned to upside risk since November's theatrics," Macquarie wrote. February 7 (MarketWatch) Gold futures posted a modest gain Tuesday for a fourth session in a row as geopolitical uncertainty kept prices near their highest settlement level in about three months. April gold rose $4, or 0.3%, to settle at $1,236.10 an ounce, holding ground at its highest settlement since Nov. 10, according to FactSet data. Market participants attributed the climb, at least in part, to worries about instability in Europe and persistent uncertainty about President Donald Trump's political agenda. A decision in federal court over Trump's executive order on immigration "will have a big impact on gold and U.S. dollar," said Chintan Karnani, chief market analyst at Insignia Consultants, based in New Delhi. If the immigration ban is opposed by the federal judges, investors may believe that Trump's policies may be challenged in U.S. courts, said Karnani. Demand for safe-haven assets, such as gold, could "zoom," he said. But if the ban clears, gold prices may crash toward $1,200, warned Chintan. Year to date, gold has gained more than 7%, while the ICE U.S. Dollar Index has lost around 1.9% so far this year. But on Tuesday, the dollar index climbed by about 0.4%, nudged higher by hawkish comments from the Federal Reserve's Patrick Harker, who emphasized a March rate increase is possible. Because gold is priced in dollars, it often moves inversely to trading in the greenback. A pause for what had been rising interest rates also been a factor in lifting gold's appeal. Lower yields make it less attractive to invest in assets that offer interest, sending more investors to precious metals, which don't bear interest. Meanwhile, March silver edged up by 6.3 cents, or 0.4%, to $17.756 an ounce, also hovering around its highest settlement in about 12 weeks. U.S. stocks saw modest gains Tuesday, which helped to limit near-term demand for precious metals as a haven alternative to equities. Gold "fundamentals are still the same and we think that [any] pullback could be an opportunity to get back in, if you have missed the move," said Naeem Aslam, chief market analyst at ThinkMarkets. "We still maintain our target of $1,250 for gold, because the [Federal Reserve] may not be able to increase the interest rate next month." "The dovish rhetoric from Mr. Trump would keep the pressure on the dollar, which will help gold to regain its mojo," Aslam added. "Moreover, French and German elections are going to produce a lot of tailwinds for the gold rally. The demand out of China and India for physical metal is still strong, so why sell gold?" Other metals prices ended lower. March copper fell 2 cents, or 0.7%, to $2.632 a pound. April platinum shed $1.20, or 0.1%, to $1,012.90 an ounce and March palladium fell $9.85, or 1.3%, to $764.45 an ounce. Among exchange-traded funds, the physical gold-backed SPDR Gold Trust was down 0.1%, the iShares Silver Trust lost 0.2%, and the VanEck Vectors Gold ETF shed 0.9%. February 8 (Sydney Morning Herald) Iron ore climbed after steep losses in the previous session, with markets waiting for fresh Chinese economic data for clues on the state of demand in the world's top steel consumer. Economic data in the coming weeks is expected to show the world's second-largest economy got off to a good start in 2017, with steady growth giving the central bank room to slowly tighten monetary policy and contain the risks from high levels of debt. Trade data is due on Friday. The ferrous sector has come under pressure since the country launched a surprise short-term rate hike last week, boosting financing costs for holders of commodities, which are priced in dollars. Steel prices slid more than 5 per cent. "We continue to feel that iron ore looks overbought and is due for a correction, especially as it looks more likely that China is interested in reining in things in given the short-term interest rate hike," said INTL FCStone in a report. Late Tuesday, China reported that its foreign exchange reserves fell below $US3 trillion for the first time since February 2011, as the central bank intervened to support the yuan and capital flowed out of the country chasing higher returns. The most-active rebar on the Shanghai Futures Exchange climbed 2.2 per cent to 3165 yuan ($US461) a tonne. In the previous session, it closed down 6.8 per cent, its weakest since January 10 at 3062 yuan a tonne. The dollar also edged up after Philadelphia Federal Reserve Bank president Patrick Harker on Monday said he would be open to raise interest rates again at the US central bank's March meeting if growth in jobs and wages continues. Iron ore on the Dalian Commodity Exchange rallied 3.1 per cent to 625 yuan ($US91). Iron ore for delivery to China's Qingdao port rose 3.3 per cent to $US83.69 a tonne, according to Metal Bulletin. "Iron ore spot prices threatened to push below $US80 a tonne after data showed another strong rise in inventories of iron ore held at Chinese ports," ANZ said in a note. China's iron ore stocks at ports hit a record high last week. 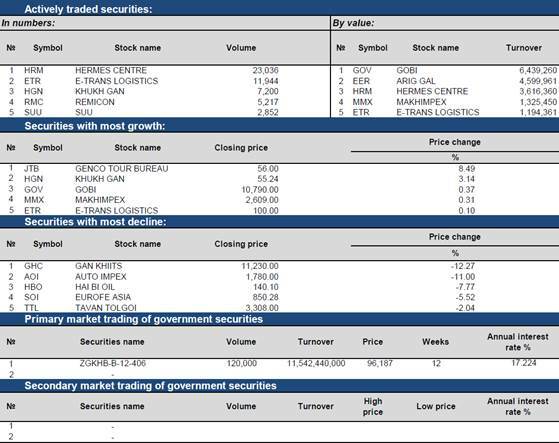 "Stocks rose by 3.3 per cent, or 3.9 million tonnes, to 123.45 million tonnes last week. This should come as no surprise, with subdued demand around the holidays coming amidst strong growth in supply." February 7 (Bloomberg) Oil dropped to the lowest in more than two weeks amid estimates that U.S. crude and gasoline inventories continue to climb. Futures slipped as much as 2.1 percent in New York. Crude stockpiles probably rose for a fifth week while gasoline supplies approached a record, according to a Bloomberg survey before an Energy Information Administration report on Wednesday. The gasoline crack, the profit from processing oil into gasoline, fell. Oil has fluctuated above $50 a barrel since a deal to trim output from the Organization of Petroleum Exporting Countries and 11 other nations took effect on Jan. 1. While OPEC members implement pledged cuts and Russia says its own reductions are ahead of schedule, U.S. production has edged higher as drillers boosted the rig count to the most since October 2015. "Gasoline is just getting slaughtered today, and it's dragging crude with it," Bob Yawger, director of the futures division at Mizuho Securities USA Inc. in New York, said by telephone. "A 2 million-barrel gasoline build would bring us to an all-time high, and crude inventories have been climbing too." West Texas Intermediate for March delivery fell $1, or 1.9 percent, to $52.01 a barrel at 12:15 p.m. on the New York Mercantile Exchange. Total volume traded was about 11 percent below the 100-day average. The contract touched $51.91, the lowest since Jan. 20. Gasoline futures for March delivery dropped 2 percent to $1.4802 a gallon, trading below the 200-day moving average after touching $1.4778, the lowest since Dec. 1. The March gasoline crack spread, a rough measure of the profit from refining crude into the fuel, dropped as much as 4.6 percent to $9.949 a barrel. Gasoline inventories probably increased 1.6 million barrels to 258.7 million last week, according to the median forecast in the Bloomberg survey. Stockpiles of the motor fuel reached a record 258.7 million barrels in the week ended Feb. 12, 2016. Crude supplies probably rose 2.5 million barrels, the survey showed. Stockpiles are at 494.8 million barrels, the highest seasonal level in more than three decades, according to weekly data compiled by the EIA since 1982. The trading boom that cushioned the profits of Royal Dutch Shell Plc and BP Plc through the price slump appears to be over. BP said on Tuesday it made a "small" loss trading oil in the fourth quarter, while Shell last week said profits "flattened" in late 2016. These companies' trading divisions thrived in 2015 and 2016 by taking advantage of an unusually strong contango -- where contracts for future delivery trade higher than spot prices -- that made it profitable to store oil. BP also said it needs to borrow money to cover spending and dividends. Statoil ASA said it would make another $1 billion of cost cuts this year. Brent for April settlement fell 82 cents to $54.90 a barrel on the London-based ICE Futures Europe exchange. The global benchmark traded at a $2.21 premium to April WTI. The dollar climbed, making commodities priced in the currency less attractive to investors. The Bloomberg Dollar Spot Index, a gauge of the greenback against 10 major peers, rose 0.4. BP's profit adjusted for one-time items and supply changes totaled $400 million, falling short of the $567.7 million average estimate of analysts. Statoil reported a fourth-quarter adjusted net loss of $40 million, compared with an average analyst forecast for a $618 million profit. Iraq's semi-independent Kurds paid international oil companies for the second time in as many weeks, settling dues for crude the producers sold in November and chipping away at a backlog of payments. Singapore is considering a range of measures to lure a listing from Saudi Arabian Oil Co., according to people familiar with the matter. February 7 (gogo.mn) Mongolian Trade Union made press session today, describing fuel price growth by Petrovis and Shunkhlai LLC as illegal. Petrovis and Shunkhlai LLC have added fuel price by 50-100 MNT last weekend. "Fuel price shall be increased based on the decision and discussion that made by relevant authorities. However, Petrovis snd Shunkhlai LLC have not proposed discussion even, they have not warned the people, resulting violation of competition law", said Head of Mongolian Trade Union Kh.Amgalanbaatar. In regards, the union stated to submit proposal and requirement to the Government and the Prime Minister. Under the competition law, If a company increase fuel price arbitrary, the company must pay customer for damages. As of today, about 70 percent of imported fuel of Mongolia is supplied at wholesale price to few big companies. Ulaanbaatar, February 7 (MONTSAME) The Asia Foundation has announced its 2017 class of Asia Foundation Development Fellows: Emerging Leadership for Asia's Future program on February 7, 2017. The seven women and five men selected are an accomplished group of change makers – talented and inspirational young professionals working in government, the nonprofit sectors, social enterprises, and media, representing 11 Asian countries. Across the region, a new generation of reform-minded individuals are creating impact, drawing from their experiences locally and globally. The Foundation's leadership development program, now in its fourth year, will bring together this network of innovators in their pursuit of creative solutions to the region's most critical development challenges. Mr. Lkhagva Erdene is an investigative journalist and executive producer of news at MongolTV, Mongolia. Lkhagva was trained at the Journalism and Media Study Centre of The University of Hong Kong on the Rotary Ambassadorial Scholarship. Upon returning from Hong Kong, Lkhagva has been overseeing the newsroom and creating the MongolTV brand of journalism bringing the station's prime time news to most-watched in Mongolia. Former Court Interpreter and Minister's Aid, Lkhagva contributed to the award winning journalism collaboration Panama Papers project from The International Consortium of Investigative Journalists. He was one of the founding members of Media Council Club, which led to the first media self-regulation council, where he serves as the Ethics Committee member. Lkhagva is a Global Shaper with the World Economic Forum, was named 30 under 30 by Forbes Mongolia, and International Leader by the UK Government's Foreign & Commonwealth Office. The 2017 Asia Foundation Development Fellows are talented individuals, under age 40, who have demonstrated outstanding leadership potential within their professional fields and within their larger community. Representing Afghanistan, Bangladesh, Cambodia, India, Indonesia, Mongolia, Myanmar, Nepal, Pakistan, Sri Lanka, and Thailand, the members of the 2017 class represent a diverse mix of backgrounds and incredible records of accomplishment, and were selected for their relevant real-world development expertise, proven community leadership, and exceptional potential. They each have experiences and accomplishments related to The Asia Foundation's fields of expertise – governance and law, economic development, women's empowerment, environment, and regional cooperation. The 2017 program will include a customized Leadership Training Program in Korea, Vietnam, and San Francisco in the US, as well as a small grant of up to $5,000 to design a professional development plan or project to be implemented over the course of the year. Summary: The newly elected Chairman of the Democratic Party (DP), S. Erdene, and DP Vice Chairman B. Purevdorj held a press conference to discuss the party's most recent caucus meeting. S. Erdene stated, "The caucus covered the Criminal Code, the Law on Conflicts of Interest, and other issues. We have received information that 40% of the Criminal Code will be amended with explanations of technical terms and regulations." The DP has established a working group to evaluate Cabinet's first 200 days in office and is set to announce their findings after discussion during their next meeting. DP Vice Chair B. Purevdorj stated that the party opposes proposed amendments to the Law on Governance and the Governance of Territories, citing that the amendment would allow an official to hold multiple public offices. Summary: Parliament's recently approved amendment to the Law on Corporate Income Tax will reduce tax burdens for SMEs with less than 1.5 billion MNT in revenue. The Head of the General Taxation Authority of Mongolia, L. Zorig, stated, "There are many import products competing with sectors that will benefit from the tax break. Specifically, in the clothing and textile industry there is 63.3 million USD in imports and 320.2 million USD for food products, totaling around half a billion USD in imports. By supporting domestic SMEs by granting tax breaks and giving them the opportunity to upgrade their technology, 500 million USD could be saved." With the implementation of the law, 4,678 SMEs will receive tax breaks, saving the businesses around 1.3 billion MNT in income taxes paid. Officials believe that the tax breaks will increase job creation among the SMEs. Summary: One of the nation's strategically important mines is the Gatsuurt mine, which holds 50 tons of gold, second only in reserves to Oyu Tolgoi. Centerra Gold has invested around 50 million USD for the development of the project, and the project is now ready to be implemented. Preliminary estimates suggest the project will yield 2.2 trillion MNT in returns to Mongolia. If Centerra Gold and the Government of Mongolia successfully sign an investment agreement, around 500 billion MNT of investment will be needed, and 69% of the mine's revenue could be invested in Mongolia. In order to increase the production of gold and to increase foreign currency reserves, the government is set to implement the Gold-2 program. The program includes starting operations at 74 key mines. Analysts say that with the implementation of Gold -2, the nation's gold reserves could reach a record high. Summary: The Mineral Resource Authority of Mongolia (MRAM) reported that gasoline prices saw an increase of 100-150 MNT per liter in the provinces and 80-100 MNT per liter in the city. MRAM and the Authority for Fair Competition and Consumer Protection will cooperate to study the possible reasons for the hike in retail pricing. The Government of Mongolia took steps to reduce excise tax for gasoline and diesel fuel to stabilize retail prices. The excise tax was reduced from 520,000 MNT to 70,000 MNT in February. The Ministry of Mining and Heavy Industry announced that an increase in gasoline prices in the global market affected prices here and that the price for imported gasoline increased by 41-60 USD per ton, compared to prices from December 2016 and January 2017. Considering the increase, the Government of Mongolia is expected to lower the excise tax for gasoline once more. In 2016, Mongolia imported 1.2 million tons of gasoline, 94% of which came from Russia, with the majority of the imports (800,000 tons) purchased from Rosneft. February 7 (UB Post) Parliament approved an amendment to the Corporate Income Tax Law on February 2, green lighting an amendment to decrease taxes by 90 percent for businesses in certain sectors to foster growth. Businesses engaged in the production of food products, clothing, textiles, and construction materials, as well as select agricultural businesses, will be eligible for the tax break. These tax breaks are mainly being offered to businesses that produce finished products, and only companies in the designated sectors with an annual income of less than 1.5 billion MNT will be eligible for the 90 percent tax break. The normal income tax rate for these businesses is ten percent, but companies who qualify for the tax break will pay a one percent income tax. During the discussion of the amendment, there were proposals by Members of Parliament to increase the number of sectors eligible for the one percent tax. However, due to massive budget deficits, the decision to approve the amendment as it was presented was supported by the Standing Economic Committee on Budget and Parliament. In some sectors, the new tax rate will be applied immediately. Businesses will be able to benefit from the new rate until January 1, 2021. February 6 -- With mid-year parliamentary elections and a tough economic environment, the 2016 year was challenging in Mongolia but proved to be yet another successful year for Tenger Insurance. The company posted a net profit of MNT 1.5 billion, a fourfold increase over the prior year 2015, while total assets grew by 22% and return on equity was 24.7%. These results were achieved through improved underwriting guidelines, favorable claims development and savings in operating expenses. Gross written insurance premiums totaled MNT 9.0 billion in 2016, a 4.0% increase compared to the same period last year. There were changes in the share of premiums written by distribution channel in 2016: premiums through intermediaries decreased, with bancassurance reducing by 12.2% due to more restrictive bank lending activities, whereas direct sales from head office increased by 10.0% and sales through branches grew by almost 40% compared to 2015. During the 2016 year gross written premium by product line increased on average by 10.2% with the exception of liability insurance, due mainly to the limited insurance budgets of legal entities. Insurance losses across all types of insurance decreased by MNT 76 million, resulting in a fall in the overall paid claims ratio by 6%, the loss ratio for 2016 falling to 37.2% compared to 43.0% last year. Tenger Insurance LLC is acknowledged in Mongolia as the insurer best able to assess risk and technically price the insurance cover in line with its stated risk appetites. The result has been consistently higher net income than the average for the Mongolian insurance market. Tenger Insurance has made considerable efforts to develop the insurance sector , while our insurance services meet international standards including the quality and financial reliability of reinsurance protection. During the last two years our reinsurance capacity increased from USD 2 million in 2015 to USD 10 million by the end of year 2016. Tenger Insurance is setting the standards for other insurance companies in terms of technical underwriting ability and innovations in the insurance field, including an on-line insurance platform. Tenger Insurance was the first to introduce new accounting policies and to upgrade core IT systems in accordance with the new requirements of the Financial Regulatory Committee. Monthly analysis of data received from branches has been implemented. The MIIS system finally supported the direct input and import of claims data. By simplifying the processes and production with the bancassurance channel, we have achieved significant reduction in headcount and improved operational risk management, internal reporting and actual expense savings. More granular analysis is now available on the performance of individual insurance products, including product value, product awareness, client satisfaction, and service quality feedback. With new analytical capabilities we are able to recognize trends and leverage those trends to add more value to our customers. Tenger Insurance provides insurance coverage to 61 corporates from the Top 100 Companies of Mongolia. In the first quarter of 2016, Tenger Insurance held a one-week training workshop on underwriting and actuarial practice for all employees, as well as other market practitioners, including representatives from the regulator, conducted by invited international insurance experts. In May, the company organized the first Financial Insurance Forum of Mongolia, in cooperation with one of the leading international insurance brokers, Willis Towers Watson. High priority is given to customer service and claim handling; our fast and efficient service is regarded as the best in the market, with settlement conducted on average within three working days.​ At Tenger Insurance the monitoring of the claim approval and settlement process is based on the principles of clarity and fairness. During 2016 the company won a number of international awards: Best Insurance Company in Mongolia by International Finance Magazine and Best Online Insurance Company in Mongolia by Global Banking and Finance Review. February 7 (MONTSAME) 'Mongol Costumes' company, modern fashion brand maker from Mongolian traditional dress is working to design and produce some garments to be displayed at the National History museum. Mongol Deel is an important component of Eastern culture like Japanese kimono, Indian sari or Korean hanbok. 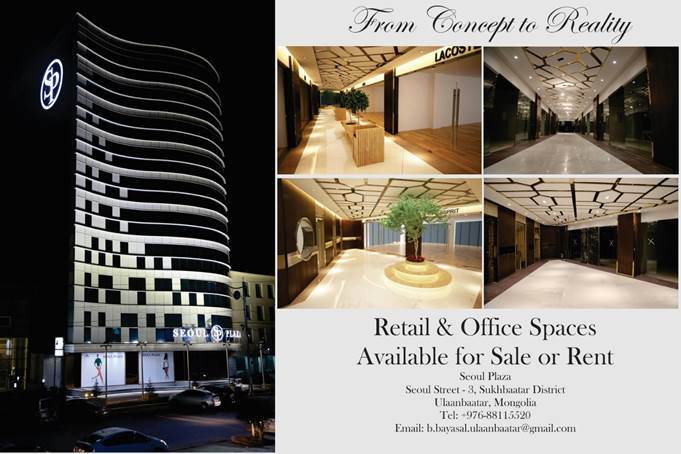 The company strives to make Mongolian modern Deel a world brand. The company has become famous with its unique professionally-designed national dress made of texture and silk brought from India, South Korea, Vietnam, Thailand, Japan and China. The company also had presented the Mongolian national costumes on the world arena by organizing its exclusive fashion shows at the UN Headquarters in the U.S. and at the UNESCO Headquarters building in France. 'Mongol Costumes' has a tailoring factory, fashion salon, library, research center, fashion show hall and folk craft museum and its complex business project named "Mongol Costumes" is expanding year by year. Having organized fashion shows in some 20 countries all over the world, the company also has participated in international festivals and big events. Their first success abroad was the Grand Prix of 'Silk Road' international festival in Russia in 2005. Thereon 'Mongol costumes' organized an exhibition 'Fashion world-Mongolia' in Berlin and Stuttgart, Germany in 2006, displayed its fashion collection in 'Art Expo' international fair in New-York, USA. The Grand Prix at the 'Ethno Erato' international competition held in Moscow, Russia is their achievement. 'Mongol Costumes' company also organizes various fashion events among Mongol origin countries, including Inner Mongolia of China and Buryatia, Kalmykia and Tuva of Russia. February 7 (Reuters) Residents of the Mongolian capital Ulaanbaatar express their anger at the government's inability to tackle the toxic choking smog that regularly shrouds the city. Samantha Vadas reports. Is this the new capital of smog? The level of pollution in the Mongolian capital Ulaanbaatar is five times higher than what the World Health Organization deems safe. Ulaanbaatar, Mongolia, February 7 (Reuters) On most winter mornings, Setevdorj Myagmartsogt wakes up to a cloud of toxic smog blanketing his neighbourhood in the Mongolian capital Ulaanbaatar, where the air quality is among the worst in the world. The capital's total emissions of harmful breathable particles known as PM2.5 surged to a high of 855 micrograms per cubic metre late last month. In comparison, Beijing's air on the same day, measured 70 micrograms. The acceptable standard, according to the World Health Organization, is 20-25 micrograms. The reading in Ulaanbaatar has been known to hit 1,000 micrograms. Hundreds of residents gathered recently in the city's Chinggis Square to protest against the government's inability to tackle the smog. Demonstration organisers collected more than 7,000 signatures. February 7 (gogo.mn) The annual "Ulaanbaatar Winter Festival 2017" is to take place at the National Amusement Park (Ulaanbaatar National Park) on this weekend, and everyone is invited. The weather forecast says it'll be warm and sunny. City Governor`s Office and City Tourism Department are organizing the festival with a vision of making the festival one of the biggest winter events in Asia. Amateur ice wall climbing competition​​. Spectators won't only watch the competitions and performances, but also can take part in it. Hot food, hot beverages, motorcycle show and art concert of Ulaanbaatar ensemble will be available for spectators and participants during the festival. Moreover winter bikes and dog sledges will be available for rent. Ulaanbaatar, February 7 (MONTSAME) P.Sergelen, Minister for Food, Agriculture and Light Industry met with I.K.Azizov, Ambassador Extraordinary and Plenipotentiary of the Russian Federation to Mongolia on February 3. At the beginning of the meeting, the Minister expressed his readiness to especially focus on Mongolia's cooperation in food, agriculture and light industry with its old friend Russia, and appreciated the contribution of Russian Government and its Embassy in the development of Mongolia agriculture sector. Sides exchanged views on realizing projects on improving the health of Mongolia's livestock and producing a new seed sort adaptive to Mongolia's climate. As the Minister touched upon the issue of supply of murrain vaccination in the frameworks of the 2nd phase of the project on livestock health, the Russian side expressed its readiness to facilitate a consultative meeting between specialists from both sides, and cooperate on this issue. The meeting concluded with the two sides expressing their willingness to expand bilateral cooperation in food, agriculture and light industry. Ulaanbaatar, February 7 (MONTSAME) Today, on February 7, Turkish Cooperation and Coordination Agency (TIKA) and Specialized Inspection Agency of Ulaanbaatar established a memorandum of cooperation in the frameworks of which a project will be implemented to improve working conditions at checkpoints operated by the agency, and fight against the spread of livestock contagious disease. Present at the event were L.Erdenechuluun, Director of Specialized Inspection Agency of Ulaanbaatar, Veysel Ciftci, TIKA coordinator in Ulaanbaatar and Ahmet Yazal, Ambassador Extraordinary and Plenipotentiary of the Republic of Turkey to Mongolia who wished success for the cooperation. Funded by TIKA, the portable work support project is worth MNT 44 million; the project's implementation will commence starting February 15. "The project will provide standard work environment and equipment for our moving workforce such as camera installation at the detention area of suspected vehicles, warm clothes and necessary inspection tools", said Director Erdenechuluun. Specialized Inspection Agency of Ulaanbaatar employs more than 500 inspectors who investigate in 27 different fields, and 34 of them work at the checkpoint stations of the capital city. As cases of livestock contagious diseases are increasing recently, the project will facilitate opportunities to monitor a situation on the spot when a vehicle has been detained. Ulaanbaatar. February 7, 2017 (Cuban Embassy) The Hon. Mr. Enkh-Amgalan Magvannorov, Prosecutor General of Mongolia, received today the Ambassador of Cuba Raúl Delgado Concepción, who conveyed a warm greeting from his Cuban counterpart and gave him the official invitation to participate in the XIV International Meeting on Criminal Sciences Which will take place in Havana in March 2018. At the meeting, Mr. Enkh-Amgalan expressed his personal satisfaction with the exchange with Dario Delgado Cura, Attorney General of the Republic of Cuba, during the celebrations of the 295th Anniversary of the Foundation of the General Prosecutor's Office of the Russian Federation where both Leaders. The Prosecutor General of Mongolia asked the Ambassador to convey his appreciation for the extended invitation and noted that the Attorney General of Mongolia will continue to work to strengthen professional relations and respect, with the Attorney General of the Republic of Cuba. MINSK, 7 February (BelTA) – Belarus' Culture Ministry and the Ministry of Education, Culture, Science and Sport of Mongolia signed an agreement on cooperation in culture in Ulaanbaatar, BelTA learned from the press service of the Foreign Ministry of Belarus. On behalf of Belarus the document was signed by Ambassador Extraordinary and Plenipotentiary of Belarus to Mongolia Stanislav Chepurny, and on Mongolia's behalf by Mongolian Minister of Education, Culture, Science and Sport Batsuuri Jamiyansuren. Stanislav Chepurny stressed that today the two countries made an important step towards broadening and deepening of interaction in culture. The agreement is intended to promote cultural relations between the two states in the field of choreography, music, visual arts, folk arts, cinematography, museum and library, and also education in culture. The document also provides for the exchange of arts groups, organization of presentations and exhibitions. Introduction to Mongolia's foreign policy. The lecture will discuss Mongolia's relations vis-a-vis its two immediate neighbours and its so-called 'Third Neighbours'. Mongolia's role in the region and its endeavour to have a more active global foreign policy will also be explored. Furthermore, the reasoning behind certain policies as well as potential challenges to a stable foreign and security policy will be discussed. The lecture is in English. As seats are limited please subscribe here for the event. NOIDA, February 6 (TNN): 38-year-old Purevsuren Dorj from Mongolia, who suffered liver failure last year, got a new lease of life at a private hospital of Noida after two of his brothers donated parts of their livers in a rare liver transplant. The procedure used was- Dual Lobe Liver Transplant surgery- a rare technique, in which liver from two donors is transplanted to one recipient. According to doctors at the Jaypee Hospital, Sector 128 Noida, Dorj had undergone a liver failure last year, and his belly had got filled with water leading to his liver being rendered function-less. The patient got to know about his liver ailment in July last year and was advised to undergo a liver transplant in October. However, the transplant was not so simple to be carried out as Dorj weighed around 130 kilogrammes. Dr. Abhideep Chaudhary, Senior Liver Transplant surgeon, at the hospital said that in normal cases, the dual lobe liver surgery is not required as only a part of liver from one donor is sufficient for the transplant. "But in cases where the recipient is overweight or is very huge in size, liver from one donor is not sufficient enough to perform the functions of the body normally. Hence, in such cases Dual - Lobe- Liver Transplant surgery is being done," he added. The three surgeries- involving removal of parts of liver from the two brothers to transplanting the graft to the patient- were carried out in December last year. The complex transplant, involving three surgeries being performed simultaneously took 16 hours. Dorj's brothers Buyan Jargae (35) and Del Gersaikan (31) donated parts of their livers to their elder brother, who was discharged from the hospital early January this year and is now back to Mongolia. Dorj is continuing with treatment follow-ups in India. February 7 (Mongolian Economy) The National Food Safety Council, an organ led by Prime Minister J.Erdenebat, held its inaugural meeting on February 2, 2017. The council discussed issues concerning the number of strategic food exports and imports in 2017, and decided to develop a guideline based on the proposals of the council members. Accordingly, it was decided that 38 thousand tonnes of beef and 20 thousand tonnes of horse meat are to be exported, and no limit will be imposed on the amount of sheep and goat meat. In addition, it was also decided that 15 thousand tonnes of wheat flour and 10 thousand tonnes of food wheat are to be exported..
Five hundred tonnes of beef, 4,240 tonnes of milk powder and 10 thousand tonnes of wheat seed are to be imported, but the council says that it would be appropriate not to import liquid milk. The Ministy of Food, Agriculture and Light Industry; the General Agency for Specialized Investigation; and the Mongolian Customs General Administration were tasked with immediately organising the preparatory works dependent on the Mongolian side to export industrially prepared meat and support exporting enterprises. February 7 (Monash University) This thesis examines three domains to address the noncommunicable disease (NCD) burden in Mongolia – Prevalence, Policy and Practice. In Mongolia, since 2000 cardiovascular disease (CVD) has been the leading cause of population mortality. The aim of this PhD study is to strengthen the NCD prevention and control policy and practice by exploring the prevalence trends of overweight and obesity in Mongolian adults, the government responses to the burden of NCDs and implementing the clinical guidelines in the primary care setting to reduce commonly occurring NCDs. A combination of quantitative and qualitative research methods to address the aims of this PhD was used. The studies estimating the PREVALENCE of obesity among Mongolian adults provided trends and dynamics in the obesity prevalence over time using international and Asian-specific BMI cut-off points. Under the prevalence, two studies were conducted: the first focused on analysing trends in the prevalence of overweight and obesity among Mongolian adults during the past decade; and the second examined whether increases in waist circumference (WC) were greater than expected from changes in weight in Mongolian adults. In this study we also estimated changes in the age-standardised prevalence of four categories of obesity (not obese; obese by WC only; obese by body mass index (BMI) only; obese by both BMI and WC) in order to assess the potential for underestimating the increasing burden of obesity in Mongolian adults when only considering weight or BMI. The findings of the first study indicate that the age standardised prevalence of overweight and obese individuals increased from 36.9% to 53.3% for men and from 52.3% to 63.3% for women between 2005 and 2013. The impact of using different obesity measures and cut-off points reflected in substantial differences in the prevalence of obesity, defined by the international and Asian-specific BMI cut-off points. The age-standardised prevalence of obesity in men and women across all time points defined by the Asian-specific BMI cut-off points was approximately 1.5-2 times that of the international BMI cut-off points. International evidence suggests that WC is increasing at a faster rate than weight and abdominal obesity because WC may be a more accurate predictor of the metabolic risks of obesity compared to BMI. The findings of the second study show that increase in WC rose more than 1.3 cm in 2009 and by 1.9 cm in 2013 than expected from increases in weight. Almost one in six persons in 2013 were classified as 'obese by WC only' and these individuals would not be detected as obese if they were screened by BMI alone. Therefore, the studies demonstrated evidence of significant increases in the prevalence of overweight and obesity for Mongolian adults between 2005 and 2013. Additionally, they provided evidence of the importance of measuring obesity using WC and not only BMI. The analysis of POLICY involved reviewing NCD-related policy documents (n=45) in Mongolia. The policies were analysed against the objectives and recommended actions of the WHO 2008-2013 NCD Action Plan. The findings of the POLICY review demonstrate that the importance of a timely and coordinated response to the emerging burden of NCDs appears to be well recognised by Mongolia's government. The main characteristics of government responses were a top-down and population health-based approach paralleled with health systems strengthening and emphasis on primary health care. However, the study revealed some areas for further improvement such as developing strategies to address chronic respiratory disease, promoting physical activity, educating the public with diet guidelines, introducing better regulation of food and beverage marketing especially to children and enhancing targeted NCD research funding. Under the practice, two studies were conducted: first focused on analysing enablers and barriers in the implementation of the clinical guidelines on hypertension and diabetes in urban Mongolia; and the second examined the roles of different primary care providers in implementing the guideline. The studies on implementation PRACTICE involved semi-structured interviews (n=30). The interviews were conducted across ten family health centres (FHCs) chosen from a list of all the FHCs (n = 136) located in urban Mongolia with primary care nurses (n = 20), practice doctors (n = 10) and practice managers (n = 10). In the first study, data was analysed using a thematic approach utilising the Theoretical Domains Framework (TDF). This exploration of the implementation of the clinical guidelines on hypertension and diabetes identified several core drivers for the successful implementation, in particular, continuing medical education, face-to-face instruction, monitoring and feedback, supply and resource and ongoing support. In contrast, the study also identified the following problems, such as time constraints, demands from other competing tasks and increased workload that prevent the primary care providers from adhering to the guidelines' recommendation. Findings of the second study suggest that adequate ongoing training is required to maximise the range of roles particular provider types, especially primary care nurses. Therefore, we conclude that comprehensive investment in distribution and implementation strategies is essential for successful implementation of the guidelines. This PhD project creates a valuable contribution to addressing the three P's holistically, namely prevalence or problem, policy and practice in the concerted efforts of NCD prevention and control in Mongolia and advancing the evidence base in the field of NCDs that has been increasing dramatically in the world. 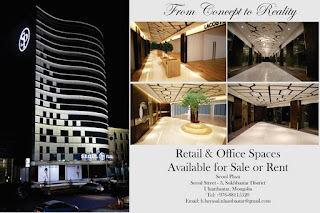 Anudari is a graduate of Agricultural and Applied Economics from the Faculty of Economics and Businesses from the Mongolian University of Life Sciences. Currently, she is pursuing a master's degree in the field of International and Development Economics at the Faculty of Tropical Agrisciences, Czech University of Life Sciences Prague. Her research topic is focused on the Impact of agricultural cooperatives on small scale vegetable farmer's livelihood in the central part of Mongolia. She is especially interested and passionate about institutional economics, poverty alleviation strategies, agriculture and youth involvement in the development sector. As a young person, she has been involved in many youth summits and conferences to help raise the voice on topics of environmental protection and agriculture development. Her first interaction with the global youth was in her high school where she went to the "Voyage to the future: Protecting the environment" students summit in the Philippines and Japan in 2011. Since that time, she has continously been engaged in many campaigns, social clubs and movements in her country. During her university years, she co-founded a "Young Economist in the Agriculture" students club where she served as a president for one and half years. This experience has helped her to develop her leadership skills and form a network of young people in the university. "I believe in cooperation of young people. There is a certain wave in Mongolia filled with bureaucracy and unwillingness to cooperate with each other at the present time. Bringing young people together, growing together and moving forward at the same speed will certainly be a big push for a brighter future of Mongolia. "YPARD gives me chance not only to provide network for youth in Mongolia, but also a chance to inform the rest of the YPARD network and world about agriculture in Mongolia". I strongly believe that every story is worth telling. In the future I will work more to deliver good, exciting and wise stories both for Mongolia and YPARD network. This way, Mongolian youth in the agriculture sector will certainly be "a drop of water in the sea. Also, i can't wait to inform young farmers, researchers, students and professionals in the agricultural sector about the events and opportunities that they can take part in. As social media is widely used amongst youth in both urban and rural areas YPARD is a good fit to better partnership in Mongolia. I will do everything within my capacity to make youth in Mongolia, to feel the same enthusiasm, passion, excitement and warmth that I have felt from YPARD since joining". We can't wait to hear more from the Youth-in-Agriculture in Mongolian as we trust that YPARD Mongolia will be successful in mobilizing the youth through Anudari's leadership. Welcome on board Anudari Enkhtur! Ulaanbaatar, February 7 (MONTSAME) Beginning this March, Science and Technology Fund and General Authority of State Registration and Intellectual Property will cooperate on the intellectual property valuation for inventions, industrial designs and geographical indications, the result of research works, experiments and studies conducted with funding of the state budget. Sides signed a cooperation agreement during an event themed 'Innovation output and Intellectual property valuation' which was held at the building of Science and Technology Fund yesterday, February 6. Since 2009, MNT 6.6 billion has been allocated from state budget for the implementation of 74 innovation projects, 16 of which are in health sphere, 11 in natural sphere, 8 in social sphere, 21 in technology and 18 in agriculture. "The basis for economy based on science is intellectual property. On national level, 252 intellectual properties are registered under the Science and Technology Fund. These have be evaluated, and put into economic use", said D.Enkhjargal, Director of Mongolian Science and Technology Fund. Moreover during the event, in compliance with the procedure on intellectual property produced by researches and studies funded by state budget, three innovation projects which have seen efficient results donated 2 percent of their income or MNT 11.5 million to Science and Technology Fund. The three projects are namely an anti-mite drug production project (MNT 5.5 million) implemented in 2015-2016 under the supervision of D.Battur, a new bio preparation production project (MNT 3 million) implemented in 2014-2016 under the supervision of D.Dandii, and a dry milk production project (MNT 3 million) under the supervision of Ch.Batsukh. J.Batsuuri, Minister for Education, Culture, Science and Sports was present at the event, and appreciated the fruit of these state-funded projects. February 7 (news.mn) Ahead of the Mongolian national celebration 'Tsagaan Sar' (White Moon), a traditional music festival entitled 'Mongolia' takes place annually. This year, more than 300 artists will participate in the music festival under the name 'Ekh Undarga'. The festival will be held at Central Cultural Palace of the Mongolian Trade Unions on 17th-19th of February at 7 p.m. Famous Mongolian traditional groups, namely, 'Domog', 'Khusugtun', 'Ikh Mongol' and 'Jonon' will perform ethnic music. Mongolian state honoured artist D.Sosorbaram is responsible for producing the festival. Tickets will cost MNT 25,000-50000. Ulaanbaatar, February 7 (MONTSAME) On February 6-7, Family, Youth And Child Development Agency in cooperation with Mongolian Lineage and Tradition Association is organizing the first national forum on pedigree to discuss its vital importance and timely issues surrounding the practice. The forum's opening ceremony was addressed by B.Khaliun, Director of Family, Youth And Child Development Agency, J.Tudevdorj, Head of the Lineage and Tradition Association NGO, D.Regdel, President of Mongolian Academy of Sciences and B.Enkh-Amgalan, Member of Parliament. Mongolians have a long history of building family trees of one's preceding nine generations. It is clear that the practice of building family trees was quite obligatory and at the same time regular among the Mongols. However, since its weakening in the 1920s, the tradition is now scarcely practiced across Mongolia. Today, a study suggests that there are only 700 people who build family trees on national level. Also, there's even an individual who knows the history of 41 generations before him. In order to raise awareness on the importance of restarting the tradition on every family level, the first forum is thus held, gathering about more than 100 delegates, including Members of Parliament and members and supporters of the Lineage and Tradition Association. The association operates branches in every 21 province and every khoroo of the 9 districts of Ulaanbaatar, and all the branches were represented at the forum to convey the voices of Mongolians around the country. February 7 (gogo.mn) Archeologists of the Khovd University have found more than 40 findings and artifacts including an ancient woman burial from Uzuur Gylan, Munhhairhan soum, Khovd aimag on Apr, 2016. Later the finds were named after Uzuul Gylan, the place where it has found. In the mummy's grave archeologists found - alongside the human remains - a saddle, bridle, clay vase, wooden and iron bowl, trough, iron kettle, the remains of entire horse and sheep, as well as "deel" (traditional costume of Mongolia). Along with the woman's remains, 30 other archeological discoveries such as clay vase, a saddle, pillows, a trough, a bridle, an iron kettle, a wooden bowl, sheep's head, a felt bag that contained a sheep's entire back, a leather bag intended to carry a cup, several goat bones and the carcass of a horse were also found. In regards, five archeologists have come to Mongolia from Turkey during June 12-21 to study the findings and they took nine types of samples from the findings. The sample result has claimed that the findings of Uzuur Gylan dates to 9-10th centuries, the period of Turkic empire fall and rise of Kyrgyzstan. Since then, the Ministry of Education, Culture and Science, Governor Office of Hovd aimag and Cultural Heritage Center are conducting restoration on the findings and total of MNT 8 million has spent on the restoration process, which is currently at 80 percent. The finds of Uzuur Gylan will be showed to the public starting Feb 15th, 2017 at the National Museum of Mongolia. Working hours: Daily 09AM - 4.30PM and closed on Monday and Sunday. January 27 (ARTGER) Being nomads, the Mongolian herders and their animals live with and try to make optimal use of the seasons. During the Mongolian harsh winter herders usually drinks melting snow for daily food. Let's try to boiling milk tea with melting snow! January 31 (ARTGER) The sheep's head is placed in a pot with root vegetables and is simmered for hours, which supposedly makes the meat soft and very tender. Mongolians have been using the boiled sheep's head for the nobles and respectful people as meal. Nowadays, this tradition is still continuing. Bolortsetseg Minjin has a bold plan for Mongolia, a country with terrible infrastructure and lots of bones. February 7 (Inverse) Bolortsetseg Minjin grew up on top of dinosaur bones. That's not unusual in Mongolia. What was unusual about her childhood is that she saw them and learned the difference between a tarbosaur and a protoceratops early. Her father, a prominent paleontologist trained in Russia, worked in the Gobi Desert, looking for the sorts of fossils that made diggers like the American Museum of Natural History's Roy Chapman Andrews famous in the 1920s. Bolor followed in his footsteps and earned a PhD in dinosaur paleontology from the City University of New York (on an AMNH scholarship). But she's keenly aware that her fervor isn't necessarily shared by her neighbors. Many Mongolian dinosaurs are better known in the West than they are in the towns and villages where they were discovered. When Bolor holds workshops in local schools, the students often can't name a single dinosaur. When she tells them about the velociraptors that once stalked their neighborhoods, minds are blown. Bolor wants to blow more Mongolian minds, but it's a hard, lonely job that is only getting harder and lonelier because the paleontologists who worked alongside her father are retiring and there's a dearth of qualified people to step into research and communication roles. There's a very real possibility that, at some point in the not-too-distant future, she'll be the only PhD paleontologist left in-country. That's why she's making plans to build a dinosaur museum in the Gobi Desert. It's also why she got herself a bus. Bolor's bus, donated by the American Museum of Natural History, is a mobile dinosaur museum on off-road tires. In a massive nation with poor infrastructure, this is how you show people their natural heritage — one bumpy drive at a time. "That museum really made a difference for the kids," she says. "Every kid comes out so excited — some kids have never even been in a museum." A bus is great — people like it, it doesn't break down — but permanent dino infrastructure would be way better. Ultimately Bolor wants to erect institutions in each of Mongolia's seven dinosaur-rich regions. The ideas is that these institutions would become hubs for local dinosaur tourism economies that will give communities a reason to learn about dinosaurs and care about their preservation. The best case scenario, Bolor creates a sort of dino-destination not unlike Drumheller, Canada. The worst case scenario, she creates repositories. After all, museums would give people a place to put the fossils they uncover, which is more needed than you might think. "We didn't know what to do," Bolor says of a recent accidental discovery by some tourists in the Gobi. "I had a park ranger with me, but she didn't have the skill to dig out that fossil. Even if she had the skill, she has no place to store that fossil. If she even had a place to store it, she doesn't have the lab to prepare it. It's one problem after another that we were facing." Mongolia has been a destination for paleontologists since Chapman Andrews found the first fossilized dinosaur eggs almost a century ago. The government of the day, not too pleased to see the Americans waltz in and make off with treasure, enacted a law declaring that all fossils would henceforth belong to the country. That was great in theory, but, in reality, minor pillaging began almost immediately then ramped up after the fall of the Soviet Union, when the country's borders opened. "When I was in college, I heard about these dinosaur eggs people were selling. A student in my university, he was carrying a dinosaur egg and wanted to sell it to some foreigner or tourist," recalls Bolor. "When we were going through this transition, going to an open market economically, people's lives were very hard. People really wanted to sell anything so they can have food on the table." By the late 1990s, though, the international black market in fossils had become borderline corporate. A Tyrannosaurus rex sold at auction in 1997 for $8 million and word got out that the Gobi Desert had tons of fossils, including many specimens of Tarbosaurus bataar, a close cousin of the T. rex, with few people keeping a close eye on it. Arguably, the Gobi has the best collection of dinosaurs anywhere on the planet. It's known not only for the sheer volume of specimens, but for the diversity and exceptional preservation. Even after 80 million years, many bones are still suspended in place as though still supported by muscles and ligaments. The bones tend to be bright white — another attractive feature for those who see fossils more as showpieces than as specimens. Poachers work with varying degrees of resources and skill. The best-funded operations carefully remove entire skeletons, but most of the time the excavation is an amateur affair. Robbers bash through bone to get to the most valuable bits — claws, teeth, hands, feet, skulls. "They do a real hack job of it," says Philip Currie, a paleontologist with the University of Alberta who has studied Mongolia's dinosaurs for a quarter century. "We would take tour groups out there in some cases, and lot of people would say they would never go back to the Gobi — they were just so discouraged to see all of these destroyed specimens." A friend of Currie's photographed a site with nine tarbosaur skeletons over an area of five or six acres in the mid-1990s. "When I went in the year 2000 for the first time to that particular site, there were none of them. They had all been destroyed," he says. Bolor founded the Institute for the Study of Mongolian Dinosaurs in 2007, with an eye towards building up her country's paleontological resources. When news of a Tarbosaurus bataar skeleton up for auction in New York City reached her, she stumbled into a new role: de facto lead on the repatriation of stolen Mongolian dinosaurs. "Luckily I found out about that auction just three days before the auction date, and reported it to the Mongolian government," she says. The president got involved. A judge ordered that the auction not proceed. It proceeded anyhow, and the dinosaur sold for more than a million dollars. But the transaction never went through. The seller, Eric Prokopi, ultimately pleaded guilty to crimes related to the import of the bones, and was sentenced to time in jail. A year of bureaucratic wrangling later, the tarbosaur returned home. This was a moment of enormous symbolic importance. In a fight between a small, poor country and the interests of foreign capital, Mongolia had won. The dinosaur was nicknamed Mongol Bataar — "Mongolian hero" — and indeed it was given a hero's welcome. Seven hundred thousand of the country's three million residents came to see it while it was on temporary display in the capital of Ulaanbaatar. The government announced that it would commission the country's first dinosaur museum, to give the national hero a proper home. But when the fanfare died out, there was still much work to be done. Bolor was hired on as chief paleontologist for the new dinosaur museum. "It was really hard," she says. The building — an old Lenin attraction — was in disrepair. Her staff was eager but untrained in dinosaur and museum science. And a facility in the capital is great, but it does little to help rural areas where the dinosaurs actually are. As it stands, most tourists hire tour guides from Ulaanbaatar to take them to the Gobi, and local communities see minimal benefits. After six months with the new museum, Bolor left that role to return to her work with the institute, including efforts to repatriate more Mongolian dinosaurs to help fill that museum. That effort has been very successful. More than thirty specimens have been brought home, including a tarbosaur skull that briefly belonged to Nicolas Cage. There seems to be less active poaching in Mongolia, and the international trade has quieted down. That's great, but it's not a solution, says Bolor. "We can't keep doing this repatriation thing, keep doing, and doing, and doing. We have to reduce this problem." Ultimately, Bolor needs scientists — paleontologists, fossil preparation specialists, museum curators. Her institute is already facilitating international training for some new recruits. Her list of potential dinosaur experts is long, though many will have to tackle the challenges of puberty first. Recently, Bolor found herself describing the job of a paleontologist to a sixth grade class. One of the kids asked if it might be possible for them to become paletontologists. "Of course," she said. The kids decided right then that they would form a fossil club. One of them asked for a show of hands, and started taking down names. February 7 (MONTSAME) A ceremony was held on February 6 at the National Park of Ulaanbaatar to hand over three cars as contribution to solving the transport problem for preservation of Great Gobi Six – wild camels, Przewalski's horses, wild asses, black tailed gazelles and Saiga antelopes. The project was initiated by the Mongolian Motor Sports Federation. Members of the federation raised funds of MNT 30 million and brought together over 140 millwrights from 18 auto clubs to re-assemble customized UAZ-469, UAZ-452 and Toyota Land Cruiser and to make a hundred road signs, said the President of MMSF Mr G.Ganbold. Great Gobi A strictly protected area was taken into state protection in 1975, as it is inhabited by endangered species such as the Gobi bears, wild camels, wild asses, black-tailed gazelles, bighorns, mountain goats and rare species of water birds, and was enlisted in the UNESCO World Network of Biosphere Reserves in 1991. February 8 (BBC News) The death of more than 2,000 critically endangered Saiga antelope in Mongolia was caused by a disease that could now threaten the entire population. Wildlife Conservation Society (WCS) scientists, who work in the affected grassland area of Western Mongolia, say the disease originated in livestock. It is a virus known as PPR or Peste des Petits Ruminants. WCS veterinary scientist Dr Enkhtuvshin Shiilegdamba told BBC News that 2,500 Saiga had already died. The animal carcasses are burned to prevent the spread of the disease. Researchers described the speed of the disease spread as "alarming". "The first case of PPR was confirmed in the Saiga on only 2nd January this year," Dr Shiilegdamba told BBC News. She and her colleagues say that this is the first deadly infectious outbreak known to have occurred in this population of animals. And beyond this one, rare species, there is concern for the impact on the wider grassland ecosystem. "Many other species share this same range," explained Dr Shiilegdamba, "including ibex and big-horned sheep." "And there are about 1.5 million Mongolian gazelle that migrate through the eastern part of the country. "If this [spreads east] and hits the gazelle population, it could be economically and ecologically devastating." One major concern is that, with the disappearance of wildlife in the area, there will be a lack of prey for the endemic snow leopard. As well as affecting the health and population of these carnivores, this could put leopards at greater risk of being shot by farmers - as a lack of wild prey drives them to take livestock. Herds of sheep, goats and other domestic livestock in the affected area have been vaccinated, but Dr Amanda Fine, a vet with the WCS wildlife health program in Asia said that "further immunisation" was needed "in not only Saiga range areas but [in the habitats] of other affected species". "We need to ensure the disease does not spread to unaffected populations," added Dr Fine, "in order to save the last population of Mongolian Saiga from extinction". The plague-like virus is killing thousands of animals, including sheep, Cashmere goats and the endangered saiga. February 7 (Creeker) Thousands of animals have suddenly died in western Mongolia due to a virus that is afflicting sheep, Cashmere goats and the endangered saiga, which is an Asian antelope. February 7 (news.mn) A farewell ceremony for Mongolian-born 'komusubi' Tokitenku, who died on January 31st, has taken place in Tokyo. Tokitenku Khuchitbaatar died aged 37 of malignant lymphoma. Some 500 people, including Mongolian 'yokozuna' Hakuho, Harumafuji and Kakuryo turned out at the memorial service on Monday to honour the late legendary sumo wrestler Tokitenku. Tokitenku, who only retired last August, competed in 63 grand sumo tournaments, including three at the fourth highest rank of 'komusubi' since 2002. February 7 (news.mn) Mongolian members of parliament competed in a chess competition entitled "Tsetsen Tushee" (literal meaning: "Wise Official"), which was held at the State House on 6th of February. MP G.Zandanshatar (in the men's category) and B.Saranchimeg (in women's category) won in this, Mongolia's first-ever parliamentary chess competition. Participating in the competition were: Deputy Speaker Ts.Nyamdorj and MPs O.Enkhtuvshin, G.Zandanshatar, Kh.Bolorchuluun, A.Sukhbat, G.Temuulen, L.Oyun-Erdene, B.Saranchimeg, A.Undraa and B.Undarmaa. February 7 (UB Post) The Mongolian bandy team, which won bronze medal at the 2017 Bandy World Championship held in Sweden from January 24 to29, returned home on February 1. Upon arrival, the team met with Head of Physical Culture and Sports Authority Ts.Sharavjamts. The Physical Culture and Sports Authority congratulated the bandy team for winning a bronze medal at the Bandy World Championship, which is the first medal captured by Mongolia. Ts.Sharavjamts said that the Mongolian bandy team will compete in the 2017 Asian Winter Games, which will be held in Sapporo, Japan from February 19 to 26, and expressed his readiness to support the team. National hockey and bandy team coach A.Mergen gave an interview during the meeting. Congratulations on winning a bronze medal. The Mongolian team also won four bronze medals from the Ice Hockey Challenge Cup of Asia. The bronze medal seems to come to Mongolia often. Yes, I think the bronze medal loves us. Our team has been competing in the Bandy World Championship since 2006. This year, we reached our goal and claimed a bronze medal. I am very excited and proud of my team. We are still pursuing this sport even if the state doesn't support us. There were times when we wanted to give up, but since we have already chosen this sport, we will pursue it until the end. The bronze medal is nice because we earned it after winning against a team. I feel pity for my athletes when they compete in a tournament and return without a medal. They sacrificed a lot of things. Words can't even describe how hard they worked. We did it this year. Mongolia played against Japan for the bronze medal. Were you feeling confident? Yes, we were. Athletes' psychology is very important in team sports. We played against Japan for bronze and won 6:5. I was very excited at that moment. I cried. This achievement is the result of our hard work. I want to express my gratitude to president of the Mongolian Ice Hockey Federation D.Davaasambuu, vice presidents Javkhlan and Batbaatar, and ice hockey enthusiasts. In the semi-final, Mongolia lost to Canada. Did you have a chance to win? The world can't imagine Canada without ice hockey, the same way we can't imagine Mongolia without traditional wrestling. There are over 3,000 professional players and 2,700 ice sports facilities in Canada. It was an honor to compete against Canada. Ice hockey development and training in Mongolia and Canada are so different, like the gap between the sky and the earth. I think we might have had a chance to win because we lost only one point to Canada. The Mongolian team went to Irkutsk, Russia by car and flew from Irkutsk to Sweden in order to save money. That was risky because your car might have broken and you could have missed the tournament. Who made this decision? We didn't have enough money to fly to Sweden. We thought about a lot of ways to go there and the last choice was by car. Our team has 24 players. We drove to Irkutsk and flew to Sweden from there. We didn't face any barriers or obstacles while driving to Irkutsk. It is 1,024 km from Ulaanbaatar to Irkutsk. We drove for three days. It is hard to train in Mongolia because Mongolia doesn't have any ice sports facilities for winter sports athletes. If we had an ice sports facility, we could do our training there and reach success in many international tournaments. We prepared for the tournament for 10 days at an ice rink in 15th khoroolol. There were three foreign players in the Mongolian team. I think that influenced the success of the team. How did you find them? The Federation of International Bandy allows teams to have up to three foreign players in the Bandy World Championship. I tried to find foreign players for the Mongolian team and learn from them. That's how I found three Russian players: Roman, Igor and Rodionov. dionov a place in their team. How much did it cost to have foreign players on the team? I don't want to talk about that. We did everything to succeed at the Bandy World Championship, and promote Mongolia to the world. Did you exchange ideas on building an ice sports facility with other non-winter sports federations? Yes, we always talk about that. Foreign experts said that the Mongolian team is good. If we had an ice sports facility, we would be more successful. If the state builds an ice sports facility, other winter sports will develop in Mongolia too. We need ice sports facilities more than prizes. Ulaanbaatar, February 7 (MONTSAME) Mongolian chefs have gained fourth place with their six medals at 'he 15th Istanbul International Gastronomy Festival held in Istanbul, Republic of Turkey. Over 2000 master chefs from 30 countries competed with their culinary skills. Member judge of World Master Chefs Society, Vice President of Mongolian Master Chefs' Union R.Batbaatar, master chefs J.Otgonpurev, B.Battulga and Ts.Mendjargal represented Mongolian chefs and won gold, silver and bronze medals in the category of Asian cuisine and three silver medals in the category of modern cuisine. January 9 (ARTGER) Mongolian most beautiful women in our Top 10 List! We will talk about the best thing of Mongolian culture, history, people and everything in between! Enjoy!! Ulaanbaatar, February 7 (MONTSAME) In an international piano competition that took place in Spain, Mongolian youngsters of Music and Dance College of Mongolia, Mongolian State University of Arts and Culture and the Children's Palace triumphed over the contestants. Seven-year-old pianist O.Nandin has entered the 13 years category to win first place under the guidance of her teacher S.Sayantsetseg. In the same category, "Hobby" school student E.Tsogt was placed second and "Sant" school student G.Enkhtsetseg gaind third place. On that note, seven-year-old gold-medalist O.Nandin has competed in the highest possible age group for her and won her second competition as she was placed first in 2015. Furthermore, six-year-old pianist D.Enerelt also took the first place in the category of 9 years old. And seventeen years old Bat-Amar, an eleventh-grade student of Music and Dance Collage of Mongolia was placed third in his category. The annual competition first took place in 1999. Young pianists from over ten countries such as Japan, China, Republic of Korea, Canada, Poland, Russia, Italy and Spain competed this year. Ulaanbaatar, February 7 (MONTSAME) On February 6, a solo exhibition 'Wind with a smell of Mongolia' by realist painter Bayar opened at the 'Best Art Gallery in Ulaanbaatar. Portraits of Mongolian well-known figures, including Marshal Kh.Choibalsan, state leader Yu.Tsedenbal, commander Lhagvasuren, writer Choinom, actor Damchaa and actress Battsetseg are being displayed at the exhibition. Moreover, Mongolian nature, animal and ordinary herder family life are demonstrated in his artworks. (Asian Fusion Magazine) Asian Fusion spent some time getting to know beautiful Mongolian model Nomi Ganbold. Read our interview below, and you'll see why. AF: When and how did you get started in modeling? NG: I started modeling right after college in 2009 in Boston, MA. A friend of mine wanted me to go to an interview with a local modeling agency called "Model Club". I went, and I got accepted. That's how my professional modeling career started. Since I was a little girl, I was always into fashion and style. I always dressed nice, just like my mother! My mother was my biggest role model. AF: What made you decide to come to the US? And why Boston, and then New York? NG: My mother always made sure that I went to the best high school and learned more than three different languages. Because of its highly-ranked educational system, she picked the United States. I graduated from Newbury College with a degree in Finance. A year later, I started earning my Masters in Business Management with a concentration in Show Director/Event Planner. My passion is 100% Fashion. Everyday I breathe fashion. New York was my dream city and where I wanted to settle down. As far as moving to New York, it just happened. I made my decision pretty much in one week, and it was truly one of the wildest decisions I have ever made. New York City never sleeps! I can't see myself sitting behind a desk all day, everyday. I like to run around, travel the world. My dream is to be known internationally as a model and an actress! So New York is the perfect city to start my journey to make my dream come true. I am truly in the right place right now! AF: Did you find any difficulties being an Asian and Mongolian model or actress in the United States? NG: Very exciting question. It always surprises people I meet when I tell them I am Mongolian. I am usually the first person that they have ever met from Mongolia. People have so many questions about Mongolia and I love talking about my country, the history, the people, and our culture! As far as being a model/actress and an Asian and Mongolian in the US, I actually feel special. Most of the organizations, companies and agencies want to have a diverse, international look, so they are always looking for Asian models and actresses, and it can actually make the job easier. AF: We are really interested in Mongolian culture. Would you like to talk about some traditional clothing and food? For example, I know that Deel is the traditional clothing of Mongolia. What kind of special occasions do you need to wear it? Can you share more details about it with us? NG: As I mentioned earlier, I love talking about my country. I am beyond proud to be Mongolian! I love Mongolian food. It's very simple, yet also very delicious. We eat a lot of beef and lamb, but not much chicken. I can actually compare Mongolian food more to Russian food than any other Asian food. We don't use that many spices, or use chopsticks. And we have the second biggest dessert in the world, Gobi, which I love very much! As for the clothing, people who live outside of the city still wear Deel everyday. It's comfortable and very warm. Almost everyone wears Deel for the Mongolian New Year. Deel is created and designed with fur on the inside, and beautiful silk material on the outside and decorated with many different prints. One of my next big projects here in New York City is to bring one of the most talented Mongolian traditional clothing designers in for New York Fashion Week. It will be absolutely amazing! AF: What are some of the latest events youhave been involved in? What kind of work are you doing for 2013 Couture Fashion Week? And how are you excited about it? NG: As an event planner and show producer, I have worked for Couture Fashion Awards in NYC as the assistant international Casting Director. Couture Fashion Week concentrates on getting designers and models from different countries, which to me is really exciting. This past season I invited the first ever designer and models from Mongolia. And it was a huge deal in the Mongolian fashion industry because no other designers had showcased their designs in NYC before. And that was one of my biggest accomplishments since I moved to NYC almost a year ago. All the modeling agencies in Mongolia prepare their models to the limit as far as their runway walk. This includes posing in front of the camera, how to do make-up and hair, how to walk, how to communicate, how to socialize, and so much more. I was very proud to see them on the runway! For the next season, I want to bring even more talented designers to the United States from Mongolia, and continue to introduce my culture, my people, and our history through fashion. AF: You are a very multi-talented person. You've been a model, actress, event planner, and fashion show producer. How would you best describe yourself? NG: I like to challenge myself. I think I get that from my mother. I grew up watching my mother doing everything by herself and being a very successful businesswoman and to me, the #1 mother in the world. So, as her only daughter, I got all her best qualities. I want to be ready and experienced when the time comes for me to shine bright. And to make my mother proud of me! AF: What's your next step? What are your future plans? NG: My next step is to create my own team. Super model Swagunir JaRed Cameron said, " I believe in team work, I don't believe in competition. Because together we can create and do more!" There are so many big projects in my mind, and want to try to make them all happen. I have my own movie project coming up that involves both directing and acting. As a model, next year I want to walk for Tokyo Fashion Week, and possibly Paris Fashion Week! So wish me luck!! (Asian Fusion Magazine) Munkhshur Tumursukh (Shuree) was born in Mongolia in 1988, to a fashion business family . Having developed a deep appreciation for both business and fashion from an early age, she was accepted at the age of 16 to Urlakh University in Mongolia, where she studied fashion design and technology. One year later, she met her husband and soon gave birth to their first son. Shortly thereafter they moved to Australia. Once in Australia, she found she had to start over again, and 3 years later, after the birth of their second child, decided to go back to school to learn English. Years later, she decided to study fashion design at Polytechnic West Tafe. In between studying, she worked at bridal and evening wear companies such us Galleria Couture, Secrettopia, Wild Violet, and TARVYDAS fashion house. "Fashion has never been just about garments, it's about feeling glamourous, to tell a story of your lifestyle. I believe fabric choice and how it is manipulated is very important in capturing the design of a garment." "I love costume and couture design. My creations are meant to be viewed on a stage or a catwalk. The main aim of my design is to create an impact on the traditional definition of beauty. Colors in Mongolia represent the natural beauty of landscapes that Mongolia is known for. Each color represents an emotion. There are a variety of new and recycled fabrics that are used in the collection. The textiles in the collection have some which are hand felted and dyed, some are screen-printed on with the designer's own design finished with hand sewn embellishments. The main motifs in my designs are asymmetry destruction, dramatism, macabre. All the costumes here have been hand-made by myself. Ulaanbaatar, February 7 (MONTSAME) 30th annual festival of best music "Morin Khuur 2016" will take place on February 12-18. Organized by the Mongolian Union of Composers, Morin Khuur /Horsehead Fiddle/ 2016 grand music festival's first stage is taking place at the Music and Dance College of Mongolia on February 12. The gala concert of the top 25 will be given at the Mongolian State Philharmonic on February 18. Around 30 songs have been registered for the festival. The registration will end on February 10. Traditional music of the Morin Khuur, Mongolian bowed two-stringed instrument (translates as horse head fiddle) was inscribed in 2008 on the UNESCO list of Intangible Cultural Heritage of Humanity. The instrument consists of a trapezoid wooden-framed sound box to which two strings are attached. It is held nearly upright with the sound box in the musician's lap or between the musician's legs. The strings are made from hairs from nylon or horses' tails, strung parallel, and run over a wooden bridge on the body up a long neck, past a second smaller bridge, to the two tuning pegs in the scroll, which is usually carved into the form of a horse's head. The larger of the two strings (the "male" string) has 130 hairs from a stallion`s tail, while the "female" string has 105 hairs from a mare`s tail. Nowadays the strings are made of nylon. The strings are stopped either by pinching them in the joints of the index and middle fingers, or by pinching them between the nail of the little finger and the pad of the ring finger. Traditionally, the frame is covered with camel, goat, or sheep skin, in which case a small opening would be left in back. But since the 1970s, new all-wood sound box instruments have appeared, with carved f-holes similar to European stringed instruments. The morin khuur`s significance extends beyond its function as a musical instrument, for it is traditionally an integral part of rituals and everyday activities of the Mongolian nomads. Playing the morin khuur is accompanied with dances, throat singing (khuumii), long songs (urtiin duu), mythical tales, ceremonies and everyday tasks related to horses. On the national festival "Naadam" praise songs are played for the most magnificent horse and for the highest ranked wrestler and archer. The songs are called "Magtaal" and accompanied by a unique style of praise and morin khuur. To this day, the morin khuur is used to tame animals. Herders in Mongolian Gobi region who face a problem when the female camel unexpectedly rejects her newborn colt after a particularly difficult birth. There is a tradition to coaxing ritual to encourage a female camel to accept a newborn or to adopt an orphan. The mother is tied close to the calf and a singer with morin khuur begins a monotone song accompanied by gestures and chanting. The use of morin khuur for coaxing ritual for baby camels came to the attention of the public in the West with the introduction of the "Weeping Camel" movie by Byambasuren Davaa and Luigi Falorn. Moreover, many festivals are held for celebrating the importance of this instrument on the Mongolian culture, like the biannual "International Festival-Competition of Morin Huur", which is organized by the "World Morin Khuur Association", which was first held in 2008 with 8 participating countries (Mongolia, Korea, China, Russia, USA, Germany, France, Japan). Also many Mongolians have morin khuur in their home, because it is believed as a symbol for peace and happiness. In regards, the second President of Mongolia N.Bagabandi ordered every families to have morin khuur at their homes. The University of Art and Culture - Here students enter in adult age for obtaining a bachelor's degree after 2 years and a master's degree after 5 years of musical education. After the master's degree the students are considered to be professional musicians, and can play at one of the state ensembles or later become a teacher at the University of Art and Culture. The music and dance college - Here usually children enter this school, which has a strong focus on music, but not exclusively. The Culture School of the University of Art and Culture - Here several qualification courses are available. Graduates from this school mostly become teachers or enter the Culture School of the University of Art and Culture. In addition, number of musical training courses in Mongolia offer dedicated program for beginners. State Morin Khuur Ensemble with the aim to inherit, promote and develop morin khuur performs several concerts annually. On Mar 7- 8, the Morin Khuur Ensemble will present its annual "Playing Love" movie soundtrack concert at the Corporate Hotel & Convention Center to promote Mongolian traditional music to the world. Moreover professional artists and State Morin Khuur Ensemble have released albums that you can buy online, please click HERE.